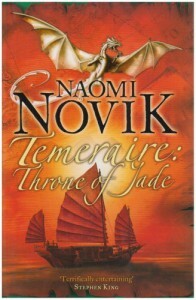 Being a fan of Patrick O'Brian and the Aubrey/Maturin series as well as Bernard Cornwall's Sharpe books, I was intrigued with Naomi Novik's Temeraire series. On the whole, I would give it a C+/B-. First to the "good" stuff: Novik is a good writer. She manages to capture the "flavor" of the Napoleonic era more often than not (though she can't hold a candle to O'Brian's evocation of early 19th century Britain). She's also created likable characters in William Laurence and Temeraire. Now the "bad" stuff (and "bad" here is only relative): There were two areas that spoiled my complete enjoyment of the novel. First, the physics of dragon flight: There are no fantasy elements in the novel (beyond the existence of dragons but, even here, they are naturally occuring animals, not magical beasts) and there's even a faux scientific report to the Royal Academy about dragons. 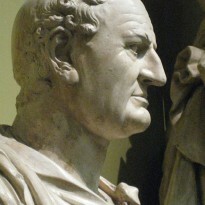 So, one expects that the accepted rules of physics, gravity, etc., are going to be obeyed. But I couldn't really accept the idea of whole crews of men climbing over flying dragons like seamen in a ship's rigging; even allowing for air sacs that reduced the dragon's weight, the sheer tonnage should have kept them on the ground or (at the very least) extremely unwieldy in flight. And that's another thing, these air sacs are mentioned several times but never explained: Are they full of hydrogen? Helium? Some other lighter-than-air gas? God knows, if they're full of hydrogen, then these dragons are flying Hindenburgs and no sane person would ever go into combat with them (particularly combat where guns are present). The second thing that bothered me about the series was that the implications of dragons and men interacting with each other are not really explored. Essentially, Novik has lifted British seamen from ships-of-the-line and put them on dragons-of-the-line. If humans have been dealing with dragons (and vice versa) since at least Roman times (there's no specific mention of Westerners dealing with them any earlier than that, though you would imagine they did) it would have had to profoundly change society. In religion alone - do dragons have souls? Did Christ or a draconic Christ minister to dragons? (In a Medieval society, these questions would have mattered.) Would a highly intelligent species (which dragons, by and large, appear to be) really have put up with humans manipulating their breeding, etc., until Temeraire comes along in the 19th century? I just can't help but think that the dragons are simply window dressing; a cute twist on the Napoleonic Wars theme. Those two caveats aside, however, I would recommend the Temeraire series to interested readers but don't expect too much.